We, Hi- Tech Polymers, were incorporated in 1996, as leading manufacturer of Industrial Rubber Parts. These products are known for their heat, wear and chemical resistance, compact design, high mechanical strength. These products are manufactured using optimum quality rubber that is procured from well known vendors. These vendors have been associated with us over a long period of time. Since our establishment, we have been blessed with the services of dedicated employees who work consistently to achieve high customer satisfaction. With the assistance of our team of experts and well equipped infrastructural unit, we have been able to offer a quality range of industrial rubber parts. We have streamlined our processes to ensure that we gain maximum possible efficiencies. We were established as a proprietorship firm under the visionary guidance of Mr. Amit Gadkari. We are have grown as one of the topmost customer centric organizations, owing to our innovative products, which are manufactured as per our intensive research on latest market trends. We are regarded for on time deliveries, superior quality, state-of-the-art infrastructure and competitive pricing. We offer our valuable customers multiple payment options. Our range is manufactured using quality raw materials that are procured from trusted vendors. We offer high quality industrial rubber parts that include silicon rubber products, viton rubber products, natural rubber products, EPDM rubber products, N.B.R rubber products, hypalon rubber products, H.N.B.R rubber products, urethane rubber products, A.C.M rubber products, fluro silicon products, neoprene rubber products and rubber products. Since our establishment, we have had a sound, state of the art infrastructure spread over a vast area. The machine installed at our unit comprises of mixing mills, hydraulic presses, cutting machine, and extruding machine. 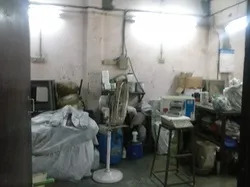 These machines are regularly maintained and upgraded as per the requirements. We strive to provide an ideal work environment to our employees. Our infrastructure ensures smooth operations. Our products undergo quality assurance tests on several parameters such as tensile strength, elongation, durability, hardness, product finishing, at each level of their production and before being dispatched to our valuable customers. We believe it is our priority to provide our clients optimum quality products. We have emerged as one of the leading customer centric organizations that follow ethical business practices. Our ethical policies make us one of the trusted business associates of our esteemed clients spread across world. We believe in products being delivered in a timely manner to our valuable customers. We offer multiple payment options that are highly appreciated by our customers. We believe in long-term, mutually beneficial relationships with our customers. Our products find application in various industries such as plants and equipment, automobile, material handling, construction, foundries, SPMS, pharmaceuticals, dairy, sugar plants, agriculture, raw rubber and chemicals, material handling, and in all maintenance related activities. We manufacture our products keeping in mind the variegated requirements of each of these industries. We have been able to achieve huge amount of success, owing to our dedicated team of employees. Driven by a desire to achieve perfection, our employees assure timely delivery of our products. Our quality controllers assure that high grade raw materials are being used for manufacturing purposes. We offer regular training to our employees to upgrade their skills as per the latest markets trends and the requirements of national and international markets. We encourage our employees to achieve maximum possible self development in the course of their work. Owing to our vast experience in this field, we are engaged in offering a wide range of high quality industrial rubber parts. We have created a distinguished name in this domain and have differentiated our offerings from those of our competitors. Owing to our innovative products, on time deliveries and fair business terms, we have become the preferred choice of many of our customers.